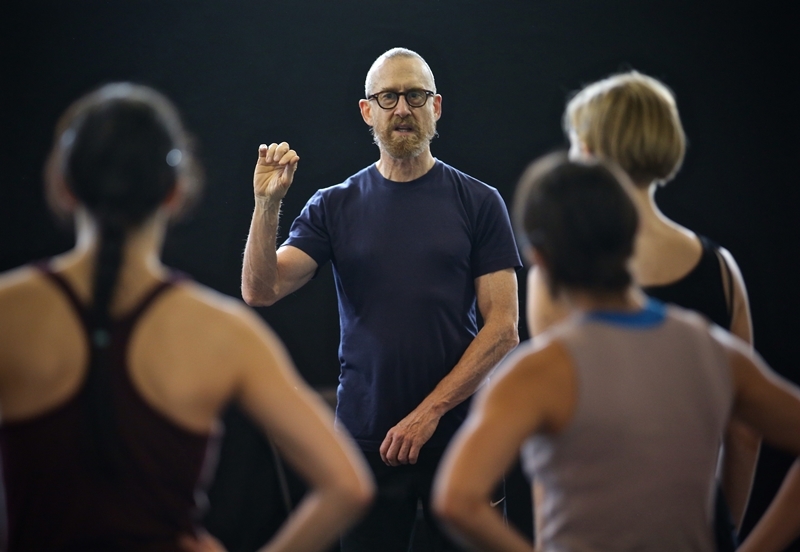 The possibilities surrounding sound and its relation to dance are a constant fixation for William Forsythe, the internationally recognized choreographer with a penchant for stripping away at the classical pretenses of ballet. In 1987, he shocked the ballet world with techno music and two ballerinas dressed in green. The piece, “In the Middle, Somewhat Elevated” is now arguably his most famous and regularly performed around the world. Raised in New York and trained in Florida, Forsythe danced with the Joffrey Ballet and later Germany’s Stuttgart Ballet. In 1984, he began a 20-year tenure as director of the Ballet Frankfurt, after which he founded his own ensemble, The Forsythe Company. Numerous artists and architects have commissioned Forsythe for performance installations, which have been featured in shows at the Tate Modern, MoMA, and the Louvre and which often use tactile materials – like flags and balloons – to engage viewers. The 65-year-old has been referred to as the successor of the prolific George Balanchine, often called the father of American Ballet. For all his accolades, Forsythe – who's in town to supervise Hubbard Street's production – has an easygoing manner that comes through clearly over the phone. He answers as “Bill,” not William, and though he sounds every bit an American (he was born in New York City), there are moments where he can’t remember the English word for something and laughs it off. He says he delights in the city's architecture, despite the limited views he’s afforded from a car he takes to Hubbard Street’s studio each morning and night. Chicago Tonight: You’ve been referred to as the “natural heir of George Balanchine.” Is that accurate and, if so, how do you measure yourself by that moniker? William Forsythe: I would say that that’s actually not quite right. Balanchine is unique unto himself. I think the real heirs to Balanchine are [Alexei] Ratmansky and the upcoming Justin Peck actually. I think these people possess an extraordinary skill set that is far more aligned with Balanchine’s way of organizing. I was trying to work on another thing because I didn’t think Balanchine was very imitable. You can’t imitate Balanchine. CT: You got your start at the Joffrey Ballet. What was your time there like and how do you view that company’s evolution? WF: Mr. [Robert] Joffrey was very good to me, he treated me like a son and was very encouraging. And after he died, his successors allowed me to do really interesting work for the company, which I thought was in the line of the company’s mission, which was to create unusual works using ballet. CT: Your 1987 piece “In the Middle, Somewhat Elevated” for Paris Opera Ballet caused an uproar in the dance world when it premiered. Since that time, it’s become one of your most famous pieces, performed worldwide. What was it about that piece and the group of dancers involved that caused that reaction? WF: I was giving women, for example, very large change of motion that would typically be assigned to a man. So it was a little bit of de-gendering, a little bit of de-genderment: how about that for a new word, right? [Laughs] It wasn’t like a big political project on my part, it was just that it seemed like the right thing to do to that music. It wasn’t a decision made in my head, it was made in my muscles. CT: Do you see a lot of de-gendering in the ballet world today? WF: In the ballet world, there’s probably some, but not much. That involves more dissolving roles. For example, I did many duets almost 30 years ago and now someone performs it and they’re being seen as, “Oh, how revolutionary!” And I’m like, okay, I guess this discussion’s been around for a long time. I think very interesting things are being contemplated, not necessarily in ballet but in the choreographic field – the dance field in general – about gender issues. And I think they’re very exciting and very rich areas to consider. CT: This is the first time your piece "N.N.N.N." will be staged by a company of dancers outside of your own. The work was originally produced by Ballett Frankfurt in 2002 and was subsequently produced only once in the U.S. Why haven’t we seen it done stateside more often? WF: It’s really simple, it’s a really practical reason why it hasn’t been produced here. First of all, you have to find a company that’s willing to take the time because it’s insanely complicated. It’s like learning a string quartet by heart and playing an instrument you’ve never played before. It’s really a mental challenge. And none of us – the people who know the piece – have had the time up until now. Once I gave up the company in Frankfurt, we all were free to stage the work and [Hubbard Street Artistic Director Glenn Edgerton] is the first director to give the work the amount of time we thought it needed. Because we’ve never staged it before, we don’t know how long it takes to do a solid staging of the work. CT: You believe in a critical-thinking approach to dance. Asking audiences not just to watch, but to analyze and engage. Why is that important – where does that mindset come from? WF: It comes from ballet. If you go to Russia, you have an extremely informed public. You have a public who’ll really know if ballerina “z” is doing a really excellent pas de bourree. Almost 99 percent of the audience in Russia will know the difference. So I guess you have to go with the attitude. Like [sculptor] Richard Serra says: I always assume my spectators are more intelligent than I am. So I go from the idea of an intelligent and possibly expert public. Hubbard Street Dance’s “Forsythe Fall Series” runs Oct. 15-18. Tickets and more information here.